October is shaping up to be another of those months in one of those years. I was holding this post for the end of the month, but I don't have anything else to post right now. My computer is overheating in a way that Beard isn't sure he can fix easily. That throws a major wrench into my blogging. Aside from uploading photos from my camera, I also sit at my computer desk when I swatch. On top of that, the more often I work out, the more my sleep schedule is shifting. Sleeping through most of the day is a problem when you swatch with partly natural light. I'm considering switching to fully artificial light and swatching in my bedroom, especially if I'll be computerless for a while. Ugh. It's fitting that today's post starts with another setback. Reshaping my nails for Halloween had become a bit of a tradition for me. This year, since I'm all almonds all the time now, I was gonna attempt coffin nails. After breaking a nail in late August, I gave up on that idea. Mostly. Today I'm gonna show you my very brief stint (about 90 minutes) with coffin nails, along with another "magical" Dance Legend polish. Mostly the polish. 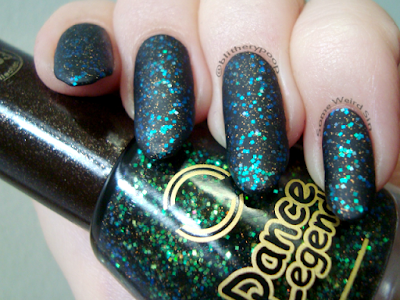 Dance Legend Sleepwalk has gold microglitter and green-to-blue square glitter in a sheer black base. Glorious, isn't it? 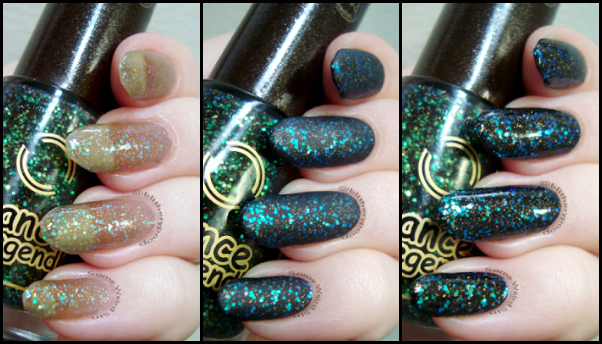 I had to have Sleepwalk from the moment I first saw Anna Gorelova's City Lights collection swatches. Anything with square glitter automatically draws me in, but make that glitter shifty and add tiny, twinkly microglitter and I can't resist! This is one coat over black. 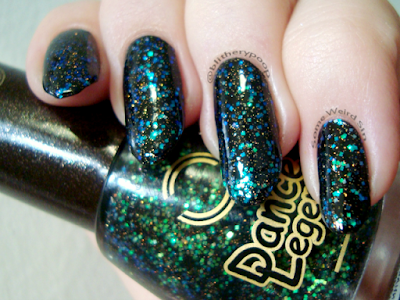 It applies beautifully, but is fairly thirsty when it comes to topcoat. I don't know if it's the curvature of my nails, the shaping job I did, or what, but it really didn't wow me. In hindsight, I'm kinda glad I didn't do them for a whole month. This is two coats without undies. It kinda needs undies. 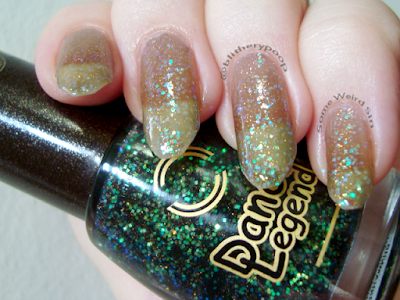 A third coat would have been too heavy on the glitter, but two coats isn't enough to make the base look good. My nails just look discolored...which they are. Bottom line: Overwhelmingly beautiful over black, kinda bleh on its own. The bad news here is that I don't think there's anywhere to get Sleepwalk if you want it. Phooey.